After a Bromeliad blooms, it will very slowly wither back and die over the next year or two... However, it will re-place itself with new plants called pups, offsets or offshoots. Most pups grow off the side of the mother plant at the base. Remove these pups when they are about one third to one half the size of the parent plant. Use a sharp knife or clippers and cut the pup as close as possible to the mother plant without injuring it. Some of the offsets are attached by a stolen... these are often very woody. Some kind of serrated knife or small saw is helpful. If the pup has a long woody stolon, detach a large part of it before potting. Always set the newly cut offset in an empty pot to let the cut "harden off." This extra time before potting it up, lets the cut form a caleous. This prevents the cut from roting or becoming infected with a fungus. Some bromeliads like Cryptanthus, Orthophytums and some Tillandsias, have offsets futher up the mother plant... their attachment is so fragile that they can be easily plucked off. Remove any brown or dead leaves before potting... then dip the cut end in a rooting hormone/fungicide such as Rootone. The mother plant will continue to produce offsets until it completly dies. Some pups are difficult to root. In such cases, place the offset in an empty plastic pot... making sure its tall enough to support the pup. Then place a small amount of peat moss at the bottom of the empty pot and place the root-less pup on top of the moss. Don't put any other mix in the pot and water as you would any other mature plant. New roots will appear soon. Potted pups will usually mature in one to three years... depending on the genus and growing conditions. Most cultivated bromeliads bloom only once in their lifetime. Bromeliads mature and bloom at different ages... depending on the species and growing conditions. To encourage blooming of mature plants, try Peters 10-30-20 fertilizer diluted to half strength. Some blooms, mostly the Billbergias, last but a week or so... while others lasts for many months. Those plants that require lower light levels are easier to bring into bloom in the house than those needing higher light levels. 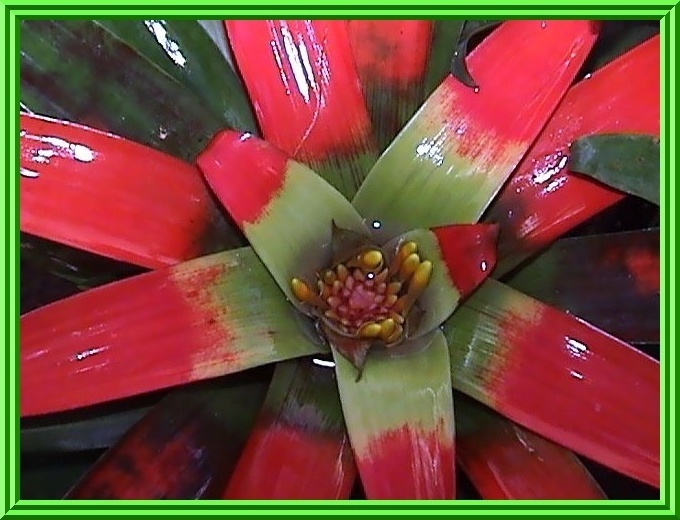 Many bromeliads have such beautiful foliage that their blooms is a treat, not the most important part of the plant. A strong change in growing conditions... such as a change in lighting... excessive dryness, may start the blooming cycle in the plant. There are chemicals that will force a bloom, but they often interfere with plant development. The production of seed, known as sexual reproduction, is one of two mechanisms that bromeliads use to reproduce themselves. The other mechanism is asexual reproduction, or vegetative propagation. The most common type of vegetative propagation is the formation of pups (offsets) at the base of the plant, either at the time of blooming, or shortly thereafter. Typically, the plant will produce around three offsets which, if they are removed when they are about one third to one half the mother's plant size, will often be followed by another 'Batch' of pups. Many of the cultivated bromeliads use this reproduction strategy. A variation to this approach occurs when the pups are produced on the plants stem. Usually only one, but sometimes two are produced initially. Removing it without destroying the mother plant requires a fair degree of skill and care. If the pup is removed successfully, a futher batch of one or two pups may be produced. 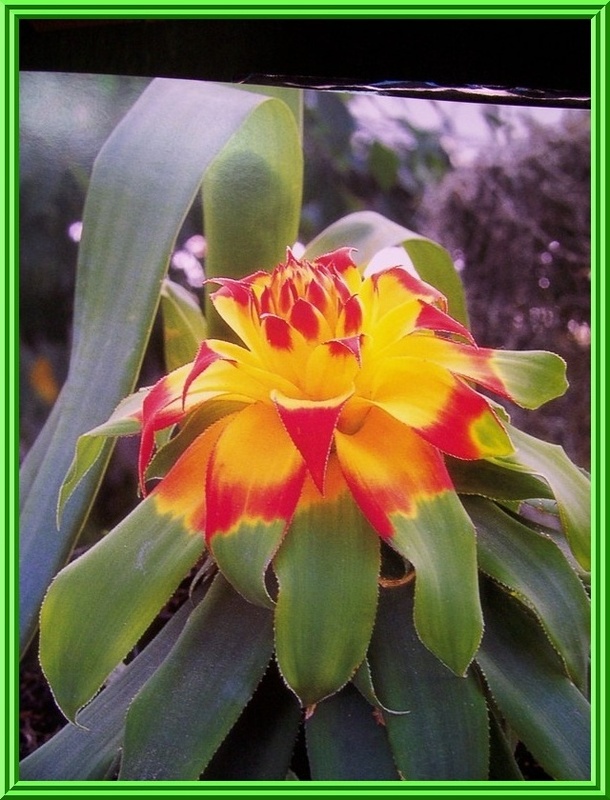 Examples of bromeliads with this strategy is the Guzmania sanguinea pictured above. An interesting modification of this strategy occurs with Cryptanthus bromeliads, like the one on the right here from my collection. In their case, pups form on the upper portion of the plants stem and, if left undisturbed, may even detach themselves. Usually though, they are detached by the grower when they are about one-third of the parent plants size by gently moving the pup from side-to-side and outwards. Plants produced at the base of or along a plants stem, are usually located quite close to it. However, in some cases, pups form at the end of this stolon. While the stolon is normally short, in some other cases it may exceed 36 inches. In all cases, these offsets can be removed with about one half an inch. Once removed, the remaining part of the stolon can be removed from the parent plant so as to improve its appearence as the stolon will not produce any more offsets. T. grandis, T. rauhii, and T. viridiflora. If you wish to vegetatively propagate a plant that produces these kind of offsets, then its best to obtain an immature plant. Otherwise, your plant may have lost its ability to produce pups. Other bromeliads produce pups on their inflorescense. Pups may form at its end, or in both locations. Plants with this type of reproductive strategy are called "Viviparous." Examples of these bromeliads are: the common Pineapple, Tillandsia flexuosa, T. latifolia, T. lymanii, T. secunda, and T. somnnians. These offsets can usually be removed when they are about four to six inches tall or, one-third the height of the parent plant. Some bromeliads produce shoots arising from underground rhizomes. Many Pitcairnia species use this method. Remove the shoots when they are one-third to one-half the parents size. While a shovel can be used when dividing larger plants, a knife is better for the smaller ones. Other pitcairnias form bulbous-like offsets, which can be broken apart to make new plants. Some bromeliads do not produce any pups at all. These are known as "Monocarpic." Examples are: Tillandsia eizii, T. prodigiosa, and Puya raimondii. These bromeliads rely soley on seed to reproduce themselves. Tillandsia sommians produces pups at each plants base, and along, as well as the end of its inflorescense. Some populations of Tillandsia latifolia are viviparous while others are not. Importantly, from a growers perspective, some populations of a species that is normally monocarpic, may in fact produce pups. Tillandsia complanata and T. utriculata. If you wish to buy bromeliads of such species, it is important to insure you are obtaining one that can reproduce vegetatively. * Some bromeliads will normally use only one reproductive strategy, but can vary that approach if it appears unlikely to succeed. "..... Resource availability plays a major role in monocarpy, as is illustrated by an occasional Tillandsia dasylirifolia specimen. In parts of its range in Mexico, this large epiphyte does produce occasional and often weakly growing offshoots, but only when fruit set is poor. Mad River Press, Eureka, CA.